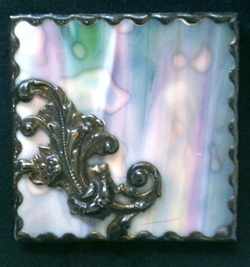 This delicate pocket mirror has a filagree embellishment on top of the chosen color of glass on one side and has a mirror on the other. It is the perfect size for any small evening bag and makes a wonderful gift for bridesmaids, birthday's, that special friend or teacher. A coordinating colored drawstring pouch is included. 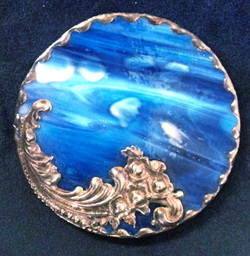 3" RoundThis delicate pocket mirror has a filagree embellishment on top of the chosen color of glass on one side and has a mirror on the other. It is the perfect size for any small evening bag and makes a wonderful gift for bridesmaids, birthday's, that special friend or teacher. A coordinating colored drawstring pouch is included. 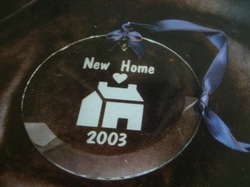 This sentimental piece has a sandblasted country home and heart along with the year. A coordinating colored drawstring pouch is included. 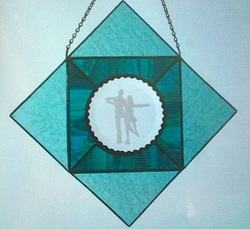 A sandblasted ice dance couple are centered inside of glue chip and opaque glass. 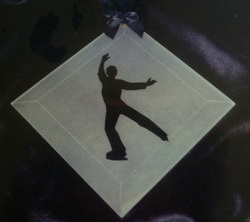 Sandblasted male figure skater. A coordinating colored drawstring pouch is included. 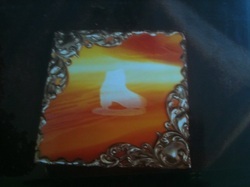 Sandblasted female figure skater in layback spin position. A coordinating colored drawstring pouch is included. 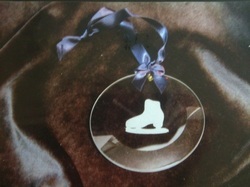 Sandblasted figure skate on round bevel. A coordinating colored drawstring pouch is included. This delicate pocket mirror has a filagree embellishment on top of the chosen color of glass with a sandblasted figure skate on the back side and has a mirror on the other. 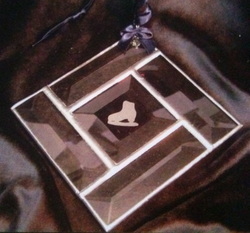 It is the perfect size for any small evening bag and makes a wonderful gift for that special figure skater or coach. A coordinating colored drawstring pouch is included. 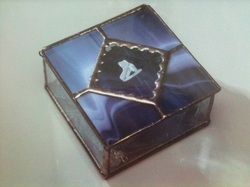 4" x 4" x 1 1/2"
This beautiful hinged covered jewel box is just the perfect place to keep those treasured competition pins in. 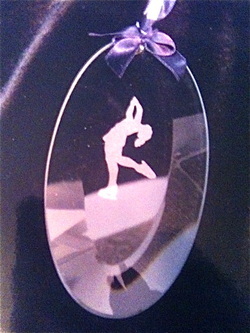 It depicts a delicate sandblasted figure skate with glue chip glass sides. 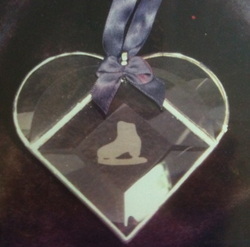 This three piece beveled heart with sandblasted figure skate expresses it all. A coordinating colored drawstring pouch is included. This 5 piece bevel ornament/sun-catcher depicts a sandblasted figure skate. A coordinating colored drawstring pouch is included. A figure skating competition momento is precisely what this gem is here. 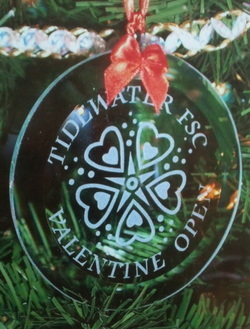 The sandblasted work depicts the clubs competition logo along with the clubs colors shown in the ribbon. A coordinating colored drawstring pouch is included. 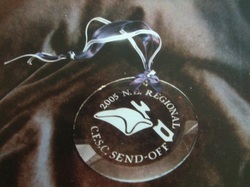 This treasured remembrance depicts the sandblasted club logo, event and year. A coordinating colored drawstring pouch is included. 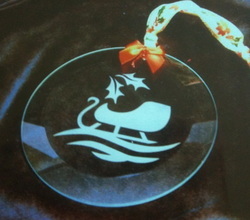 Sandblasted sleigh and holly leaves. A coordinating colored drawstring pouch is included. 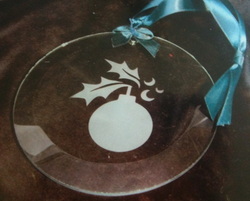 Sandblasted Christmas ball and holly leaves. A coordinating colored drawstring pouch is included.